Desta is having a bowling party to generate funds for a very important project. I was born in Ethiopia and my mother and I are returning there this summer with specific goals in mind. I will be volunteering at an orphanage for two weeks. Many Ethiopians are in dire need of medical supplies. The school children need educational materials. The funds that we collect from this bowling party will help to pay for some of the expenses necessary to get these much needed items to Ethiopia. Please come and support me in this effort. Our concern for the world should be active. Thank you! 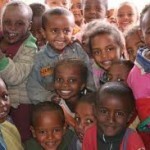 Let’s help the children in Ethiopia while we have fun! Come join me! Hope to see you there! Bring a friend!